Loved these pieces from Alex Woo. 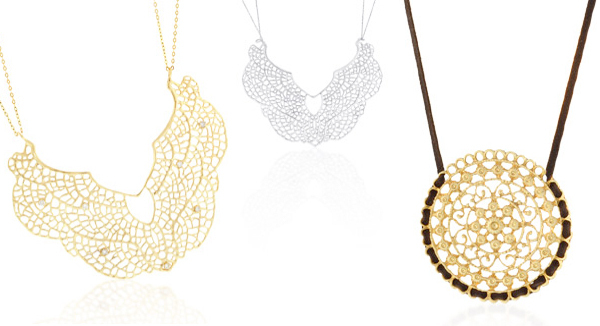 The assortment of jewelry offered is amazing… from typographic pendants to iconic shapes. I especially love the filgree delicacy of these pieces and how the cord is incorporated on the second piece shown above. Narissa Large Crescent Fan Necklace, yellow gold with diamonds $6,046. Sterling Silver, $478. Zahrah Necklace, yellow gold vermeil on a suede cord, $548. Oh, so beautiful! Takes my breath away. The perfect spring and summer jewelry. So lacey and feminine! Alex Woo makes nice pieces. I especially like her numbers & heart! I want a Alex Woo Little Numbers diamond number pendant! Waiting for me tax return in hopes that I can afford one then. About a month ago Daily Candy had a discount code for Little Faith and Little Notes pieces. I think it was DCWOO. these are so delicate and beautiful! they look like beautiful little lace fans. thanks for the post.